Our innovative home theater designs and media centers can adapt to any space, whether you are building a new home, remodeling a spare room or completing an unfinished basement. Whether you would simply like to upgrade your family room with surround sound and an LCD television or create your very own movie palace, we can help you to enjoy the authentic theater experience. 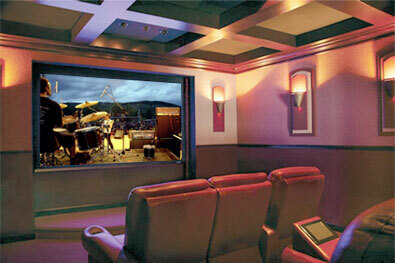 Creating a luxury home theater today is limited only by your imagination. Today's advanced technology means you can now have a superior level of audio and video in your home entertainment room that surpasses the impact and realism of even the best commercial cinema. Other outstanding new technology includes features such as special acoustics, sound proofing, drape and light automation, multi channel audio, universal remote, custom theater carpet and theater seating. 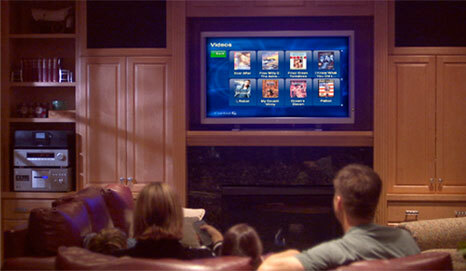 Enjoy a media center with high quality video and audio from anywhere you sit. Furthermore, we can take the clutter usually found in the family room and conceal the electronic components in cabinets and walls. Now, projectors may be hidden in custom-made tables or bulkheads, speakers can be flush mounted to walls and ceilings, and retractable projection screens just disappear into overhead cavities.